It's one of those years that's going to take some time to get used to, I think. Unlike 2011 and 2012, which I was able to take more in stride, this year is already shaping up to be more like 2010 in that I just can't quite get my head around the fact that it's here. Of course, I'll get over that feeling soon enough, but I think a big part of why I feel that way is that I spent so much of last year racing forward to what was next that it was over before I knew it. At its outset, 2012 seemed to offer myriad possibilities. That was certainly true, in a sense; in reality, though, my 2012 — not discounting all the personal and professional progress I've made — was primarily to set the groundwork for what is shaping up to be a great 2013! And so, in continuing a long-standing tradition, I dust off the cobwebs on this blog for a second consecutive evening to present my doodle for 2013, which is interestingly the first year in my lifetime to have four different digits. They don't take too long to create, but it's important to me, because I always take care to inject a small bit of both my general sense of self at the time as well as my hopes and dreams for the coming year — even if I'm rushed, and even if I never make those thoughts explicit here. And I enjoy looking back at how those aspirations have developed; how many have been achieved while others remain unmet; and how, with another year's experience and the benefit of the hindsight it brings, I'm becoming a newer and better person week after week, year after year. 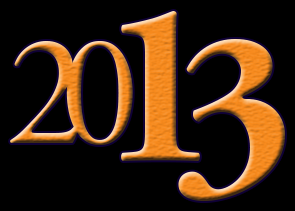 To be sure, I can't wait to do this again in another year... but in the meantime, I'll strive to enjoy 2013 to its fullest!